In The Princess and the Goblin, George MacDonald treats us to a rich imaginative adventure. Like Bilbo Baggins, however, we must be a bit uncomfortable to get the most out of it. This little tale is incredibly sophisticated, and to understand it best we must become little children again. As adults, we have learned too much to really understand the magic of true fairy tales. When Jesus said to let the little children come to Him, I believe that one of His meanings was that we must shed our worldly prejudices and return to child-like faith and innocence. In Princess, this is especially true, for us and for Princess Irene. In Princess, childish wonder and awe are absolutely requisite for us to really “see” Grandmother. Even if she seems unsafe, remember that Aslan is not a tame lion and that Gandalf afflicted the comfortable hobbits to awaken their desire for what is the true good. C.S. Lewis said that George MacDonald baptized his imagination. In The Great Divorce, Lewis wrote MacDonald in as the ambassador from heaven. In his own writing and in Lewis’s treatment of him, I think that MacDonald has a gift for drawing back the veil between the spiritual world and the material world. It would be terrifying for us mere mortals to look on real angels and demons, and so, in the world of Faerie, they are disguised as goblins, fairies, elves, dwarfs, princesses and godmothers. This makes them accessible to us in a guise that we can tolerate. In the opening lines of Princess, MacDonald tells us that Princess Irene is eight years old but will become “much older.” On a rainy day, Irene sneaks out of her royal rooms and explores her old country castle only to discover a really old grandmother in a hidden room. Irene immediately loves the old woman and trusts her. Most children share in Irene’s faith. Adult readers, however, are skeptical and uneasy with this mysterious creature. What is magical and fairy-like to children, is dark and witch-like to parents. Irene tells her nursemaid all about her newly discovered grandmother, only to not be believed. When Grandmother explains to Irene why the nurse cannot come to her room, we understand that it is because the nurse is not capable of belief. She has not been called up to the special hidden room because the old woman only reveals herself to those will see and believe. Further, Grandmother tells Irene that she will be challenged in the days to come and that she will be tempted to think that all of this was just a dream. Grandmother promises that she will do all in her power to help Irene truly believe, but that ultimately the princess must choose of her own free will to persist in her belief. As readers, and readers of Narnia in particular, we hope that she is not like Susan Pevensie, and that she has not grown so old that she cannot grow young again. Readers of Lewis and J.R.R. Tolkien will delight in exploring the archetypes and source material for Narnia and Middle Earth in this robust little story. If we have eyes to see, we will see the parentage of Gandalf and Aslan in Grandmother. We will see that Grandmother is not tame and that she can’t be found when she doesn’t want to be. If we rightly understand the goblins as Curdie does, we will see Gollum in them. We will see those bitter and dark creatures as something that used to resemble humans before they went underground. 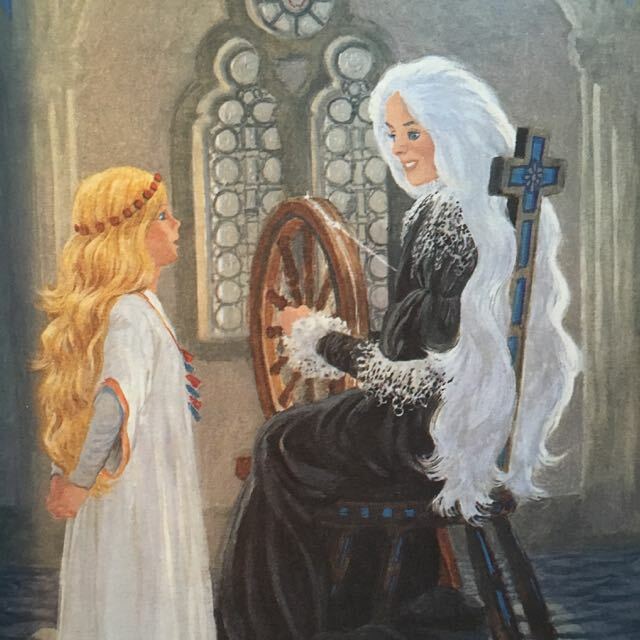 If we wonder at the thread that Grandmother has spun for Irene and Curdie, we will notice how it resembles the rope of Galadriel and how it gives rescue and a way home to those who are lost and blind. If we listen to Curdie’s rhymes, we will be reminded of Bilbo and Gollum’s game, and we will know that both scenes are borrowed from Beowulf. In The Everlasting Man, G.K. Chesterton argues that all myths are true but that Christ is the Truth myth. According to Chesterton, we were wired for belief at our creation, so that we would be able to enter into the greatest act of faith: belief in Jesus Christ. As post-moderns, we tend to think of “myth” as being an untrue fairy story. Chesterton argues that old (and new) myths are true in that they point us to the true story of God, His creation, and His redemption of humanity. Our primal love of myth is us trying to remember what God wrote on our hearts before our birth. Myths are the echoes, albeit distorted, of Truth. This gorgeous story is ideal for children as young as you can get them. Real fairy tales like this are the best kind of nursery food to feast on. And, if you are lucky, your children will call out, “Again!” and, “Again!” giving them the chance to re-enter the magic many times over. If you can refrain from trying to make the story less scary, Irene may be able to take the children by the hand and lead them through this world that is more substantial than adults want to believe. This adventure will help to shape their moral imaginations and will prepare them to embrace the white magic of Good Friday and Easter Sunday. As I was writing this, a new episode of Center for Lit’s podcast series, BiblioFiles was posted. In it, the Center for Lit crew talk with Andrew Pudewa about George MacDonald and his heirs and how the genre of fantasy connects us with things that are as old as time. It is an excellent podcast and I highly recommend it. If you want to learn a little bit more about MacDonald and his stories for adults, check out this Rabbit Room podcast about George MacDonald, also posted recently. The version which I photographed for this review is part of the Illustrated Junior Library series. This out of print series is one of my most favorite children’s series as most of the texts are unabridged and accompanied by gorgeous illustration. At the time of writing this, the price is around $30. I purchased my copy for less than $8. If you decide to look for this one, just be patient. My family and I really enjoyed the unabridged Audible version of this book narrated by Ian Whitcomb. Best of all, if you buy the $.99 kindle version, then the audio is just $2.99. The princess and the goblins is a favorite. My daughter was 6 when we read it. I must say we enjoyed the sequel The princess and Curdie even more. But the knowledge gained from reading the first book helped increase our appreciation of the second. The edition I read was illustrated by Nora Unwin and we very much liked it. It will be DD’s Christmas gift this year.